← BLACK ON BLACK VIOLENCE-WHAT’S GOIN’ ON? I’m a man who was spiritually, emotionally, mentally and physically abused by my then wife. She would not only slap me, but punch me…and yes I did provoke her. My provocation was that I had suffered viral encephalitis, was hospitalised for 2 months and came out in a wheel chair. For her, she was justified in withholding money and belting me because I was a lazy (&&T^%TU who wouldn’t go and work. It really is a woman’s right to slap and punch a man because its true the man provoked her in the first place. Hhhhmmmm, I don’t know about this one. Personally, I wish everyone would keep their hands to themselves. OK, for the sake of argument, a woman slaps or punches a man that “provoked” her, and he beats her for putting her hands on him – then what? Also, I am a bit confused with the first part of your comment. Are you saying that you were in a wheel chair, recovering from an illness, could not work – and you were considered “lazy” and refusing to work? Under those circumstances perhaps you were too ill? Or perhaps your wife did not believe you were that ill? Or, perhaps you recovered and played the sick card for too long? I don’t understand. I am sorry to hear that you were abused by your wife. If people cannot get along without violence and abuse, they should not be together – just my two cents. I hope life is much better for you now. ssofdy. My comment was a touch sarcastic having read this paragraph. 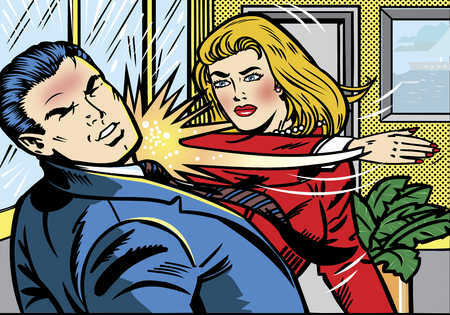 I read far to often that women are justified in hitting / slapping men, because they were provoked to do so by the man. And its extremely hard to be a male and get any kind of help when your abused by a female in our modern society. Thanks for clearing that up for me. I have known men who were slapped after touching women inappropriately and without their consent. Of course that was a time when more men were gentlemen in conduct and a different culture. Now, women will get hit back, and suffer worst physically than a reciprocated slap. Unless you are fighting for your life or the lives of your loved ones – I find it hard to accept people hitting others for no good reason. The problem with being “provoked” is the fact that many people will use any and every excuse to become violent. “He looked at me wrong.” “She said something I didn’t like.” “I don’t like him.” The excuses are limitless. Not too many humans have self-control these days. If only we could learn to fortify our inner strength, then what people say or do most times will not matter. As far as men not getting help for domestic violence – it is unfortunate. But it is also a fact that more women and children are abused, and therefore – our society focuses of the most vulnerable of our culture first. Perhaps you could someday start a support group – you think?